Comments: A diamond in the rough – this is such a SMALL STEALTHY camera that it’s a perfect A or B cam for most productions. How do you "supersize it" use and external recorder such as an Atomos Ninja and record the clean HDMI output from this camera and guess what? You’re basically getting the same image quality as you would from the C300 – for a lot lot less. Shhh.. I would shoot with the C-Series cameras without hesitation over ANY HDSLR solution out there – period. Why? The built in features in these cameras will quickly erase the price difference once you consider all of the accessories you end up buying for your HDSLRs to make them do what these cameras can do right out of the box. 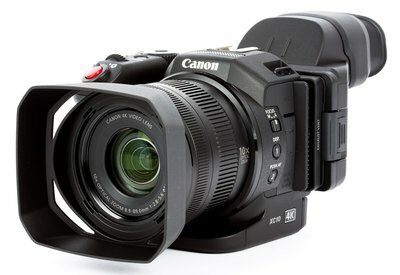 Description (from B&H): The Canon EOS C100 inherits the design concept of the EOS C300, which put DSLR quality video in a groundbreaking form factor with the key features of a more traditional video camera. The C100 has been optimized for run-and-gun and one-man-band style shooting, a specialty of event videographers, documentarians and independent filmmakers. This camera is about 15% smaller than the C300, and yet its 1080p image will hold-up nicely beside that of the more expensive camera. The C100 even has a few features not found in the C300, like One Shot AF, Push Auto Iris, a built-in microphone and non-compression HDMI out with superimposed timecode and 2:3 pull down marker. Comments: I was one of 4 filmmakers to shoot the first test films with this camera. I would recommend this cameras hands down to any filmmaker – especially TV, Indies and documentary shooters. The latitude of the exposure, and low light performance are stunning. This is currently one of the top cameras out there in the market and has truly taken over the market since it was released nearly two years ago. This is basically the 5D MKIII all grown up – with all of the professional production features one needs. Time code, XLR inputs and audio monitoring… this is HDSLRS as they should have been.Also available in PL Mount. Description (from B&H): The EF-mount C300 Mark II Cinema EOS Camcorder Body with Dual Pixel CMOS AF features a Super 35mm CMOS. This provides faster and more accurate autofocusing to assist users when operating with small crews. The EF lens mount on the EOS C300 offers compatibility not only with Canon’s existing broad range of DSLR lenses but also with their line of EF-mount CN-E cinema prime and zoom lenses. The Super 35mm sensor is paired with the Canon DIGIC DV 5 image processor, which uses an innovative method of breaking out red, green, and blue data to enable color performance on a level that would otherwise require three separate chips. The camera records up to Full HD resolution video to CFast 1 cards using the XF-AVC codec, and H.264 format in MXF wrapper. For more flexibility to adjust your image during postproduction, the camera also offers Canon’s Log gamma mode, which results in excellent tonal reproduction in the highlight and lowlight regions of an image, and an expanded dynamic range. 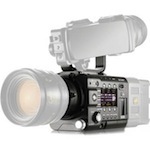 In terms of connections, the camcorder features two 3G-SDI outputs, timecode I/O, and genlock input BNCs. The body has a modular design that can either be stripped down completely or be built up using the included handle, 4″ rotating LCD unit with full controls, grip, and thumb rest. Comments: This is Canon’s marquee camera for 4K production and it’s gorgeous. Coupled with certain external recorders it’s capable of up to 120 frames per second and renders an image that is very close (but not quite) the Alexa – the current gold standard in digital cinema. Definitely a very worth camera to consider when you consider the price, weight and size. Also available in PL Mount. 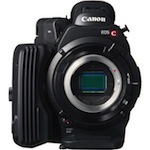 Description (from B&H): The Canon EOS C500 4K Cinema Camera (EF Lens Mount) represents Canon’s first foray into the world of 4K digital cinema production. Sharing a sensor with the earlier EOS C300 camera, the EOS C500 fulfills the potential of the large (Super 35mm-size), high-resolution (8.8 Mp effective) CMOS imager by offering full 4K RAW output via 3G-SDI. 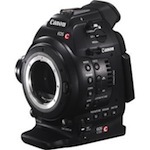 The C500 also has a body type in common with the C300. Featuring large, accessible buttons with ridges dividing them, the EOS C500 has been designed expressly for the craft of digital cinema. Its signal output is similarly appropriate: At rates up to 60 frames per second, the 10-bit 4K RAW data stream output can be recorded to an approved external device (sold separately) at full resolution. Using a format called 4K half RAW, which halves the horizontal resolution, you can capture up to 120 fps to the external recorder by using both of the C500’s 3G-SDI outputs. Comments: Technically a DSLR in terms of ergonomics, but this camera was designed for cinema purposes, allowing you to shoot 4K internally to CF Cards, and crop the sensor to Super 35 mode when pairing with specific lenses (such as the Zeiss LW.Z). THIS IS CANON’S BEST KEPT SECRET. The fact that you have all of the class-leading still the features of the camera above (1DX) AND that you can shoot 4K video… well it’s an incredible camera, that is likely the smallest 4K "Pro" camera out there that I would consider using on almost any job. The cons: lack of frame rates over 30fps. The Pros: as you’ll see in the video below it shoots in the dark! 3200 and even 6400 ISO is clean as a whistle, so much so that we had to add grain to the video below. Description (from B&H): Designed specifically for the unique demands of the motion picture industry, the EOS-1D C Camera from Canon is a breakthrough in hybrid HDSLR technology–able to record stills, 4K and Full HD video, to either two on-board CF cards or uncompressed Full HD to outboard recorders. One of the largest benefits of having 4K video technology in a DSLR body is that it will be able to go places that other larger 4K cameras cannot, providing new ways of composing and capturing scenes. 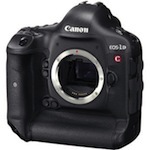 It is also compatible with the entire fleet of Canon EOS lenses already available, and perhaps already in your arsenal. The EOS-1D C was built to shoot cinematic quality, in a compact and versatile EOS body. It is able to capture 4K (4096 x 2160), 24p (23.976) content directly to its on-board CF memory cards. It does this by using an 8-bit 4:2:2, high bit rate Motion JPEG compression scheme–allowing 4K content to be acquired in virtually any shooting environment, without an off-board external recorder. Comments: With the XC10 4K Camcorder from Canon, professional UltraHD 4K recording capability is presented in package ergonomically designed for handheld operation and portability. The camera incorporates a 10x f/2.8 to 5.6 SLR-style manual zoom lens with auto and manual focus capability. The 4K recording in a compact form factor is made possible by the camera’s 1″ CMOS sensor that is backed by a DIGIC DV 5 image processor. With a 4224 x 3164 total resolution, it is able to capture video at up to 3840 x 2160 and 4:3 photos in up to 12-megapixels (4000 x 3000). The 8.9 to 89mm lens yields a 35mm equivalent focal length of 27.3 to 273mm in video mode and 24.1 to 241mm in the 4:3 photo modes. Video is recorded with H.264 compression and packed in the widely supported MXF wrapper. Bitrates 35 and 50 Mbps are available for 1080i/p recording, and there are 205 and 305 Mbps modes (depending on frame rate) for UltraHD 4K. Description: With the XC10 4K Camcorder from Canon, professional UltraHD 4K recording capability is presented in package ergonomically designed for handheld operation and portability. The camera incorporates a 10x f/2.8 to 5.6 SLR-style manual zoom lens with auto and manual focus capability. The 4K recording in a compact form factor is made possible by the camera’s 1″ CMOS sensor that is backed by a DIGIC DV 5 image processor. With a 4224 x 3164 total resolution, it is able to capture video at up to 3840 x 2160 and 4:3 photos in up to 12-megapixels (4000 x 3000). The 8.9 to 89mm lens yields a 35mm equivalent focal length of 27.3 to 273mm in video mode and 24.1 to 241mm in the 4:3 photo modes. Video is recorded with H.264 compression and packed in the widely supported MXF wrapper. Bitrates 35 and 50 Mbps are available for 1080i/p recording, and there are 205 and 305 Mbps modes (depending on frame rate) for UltraHD 4K. Comments: Pretty darn cool little camera. 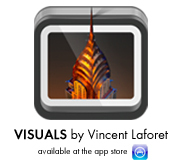 Needs work in terms of features and battery life – but the image quality is hard to ignore. 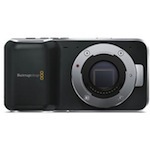 Description (from B&H): The Blackmagic Pocket Cinema Camera from Blackmagic Design is a compact Super 16 format camera designed for digital film production. The Super 16 sized sensor has an effective resolution of 1920 x 1080 and is capable of capturing 13 stops of dynamic range. The Pocket Cinema Camera records Full HD video in either the lossless CinemaDNG RAW or Apple ProRes 422 (HQ) format. The active Micro Four Thirds lens mount can accommodate a growing range of MFT format lenses as well as a host of excellent legacy lenses via optional adapters. Blackmagic Design has packed all of these impressive features into a remarkably compact (5 x 2.6 x 1.5") and lightweight (12.5 oz) magnesium alloy chassis. Comments: The BlackMagic Micro Cinema Camera MFT Mount is a revolutionary little camera designed to give huge results out of a tiny package. A Super 16mm sensor is mated to a Micro Four-Thirds lens mount similar to the the BlackMagic Pocket Cinema Camera. This gives the camera roughly a 3x crop factor when compared to a full-frame image sensor. What really sets this camera apart from traditional small action cams is the 13 stops of dynamic range and a global shutter at up to 30p! No more jello shutter! If you need higher fps, the traditional rolling shutter can be used up to 60p. HD footage can be recorded to the SD card slot in 12-bit CinemaDNG RAW or 10-bit ProRes flavors. The Micro is powered by Canon LP-E6 batteries, each one lasts about an hour and a half. The Micro also sports a weird “Expansion” port on the side. This unique feature allows you to use many additional features when you want them, but doesn’t the burden camera with extra size and weight when you don’t. The included breakout cable gives you LANC, DC power, video out, genlock, and 4 analog PWM radio remote control inputs so you can map controls to a joystick for drone use. A 3.5mm stereo audio input, HDMI output, and top and bottom 1/4″-20 mounting points round out this impressive little camera’s features. Description: The BlackMagic Micro Cinema Camera MFT Mount is a revolutionary little camera designed to give huge results out of a tiny package. A Super 16mm sensor is mated to a Micro Four-Thirds lens mount similar to the the BlackMagic Pocket Cinema Camera. This gives the camera roughly a 3x crop factor when compared to a full-frame image sensor. What really sets this camera apart from traditional small action cams is the 13 stops of dynamic range and a global shutter at up to 30p! No more jello shutter! If you need higher fps, the traditional rolling shutter can be used up to 60p. HD footage can be recorded to the SD card slot in 12-bit CinemaDNG RAW or 10-bit ProRes flavors. The Micro is powered by Canon LP-E6 batteries, each one lasts about an hour and a half. The Micro also sports a weird “Expansion” port on the side. This unique feature allows you to use many additional features when you want them, but doesn’t the burden camera with extra size and weight when you don’t. The included breakout cable gives you LANC, DC power, video out, genlock, and 4 analog PWM radio remote control inputs so you can map controls to a joystick for drone use. A 3.5mm stereo audio input, HDMI output, and top and bottom 1/4″-20 mounting points round out this impressive little camera’s features. Comments: I have a love/hate relationship with this series of cameras – but the image quality and RAW output for the relative price to the competition on both this and the 2K version of the camera are hard to ignore… I said it best in this full review here. 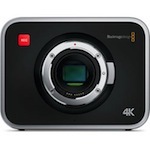 Description (from B&H): The Blackmagic Production Camera 4K from Blackmagic Design features a Super 35mm sized image sensor with a global shutter and a Canon EF compatible lens mount. The camera is capable of recording Ultra HD 4K in the visually lossless, compressed CinemaDNG RAW or Apple ProRes 422 (HQ). The built-in recorder utilizes removable 2.5" SSDs, which enable the high data rates required by RAW and 880Mbps ProRes. The camera’s ability to expose for 12 stops of dynamic range lends the image a truly film-like look, and the Super 35mm (21.12 x 11.88mm) sized sensor approximates the standard of traditional film. The Blackmagic Production Camera 4K retains the beautifully crafted design and machined aluminum chassis of the original Blackmagic Cinema Camera. Much like its predecessor, this camera features a 5" touchscreen LCD display with 800 x 480 resolution, which enables monitoring and playback as well as an efficient means for navigating the menu and entering metadata. The camera also includes a full license for DaVinci Resolve color grading software and UltraScope for live scopes via a Thunderbolt connection. Comments: BlackMagic must have been listening in on our office conversations! We thought the previous full size URSA was just too big and heavy to be used on anything except on a large production locked down on sticks. Enter the BlackMagic URSA Mini 4.6K Digital Cinema Camera. This machine weighs a svelte 7 pounds, less than half what the original URSA weighed (16.5 lbs.!!!) The Mini features a 4.6K, global shutter sensor with 15 stops of dynamic range. The global shutter will work up to 30p, otherwise the rolling shutter takes over and records up to 60p. The Mini can record UHD (3840×2160) in ProRes 444 XQ at 312.5 MB/s all the way down to 1080p in a ProRes 422 Proxy at 5.6 MB/s. It can record uncompressed raw data into CinemaDNG at up to 60p as well as compressed raw at 3:1 and 4:1. It can also record slow motion footage up to 160p at 1080p. This thing has so many recording options it will make you dizzy. Good thing it has dual CFast 2.0 memory card slots! 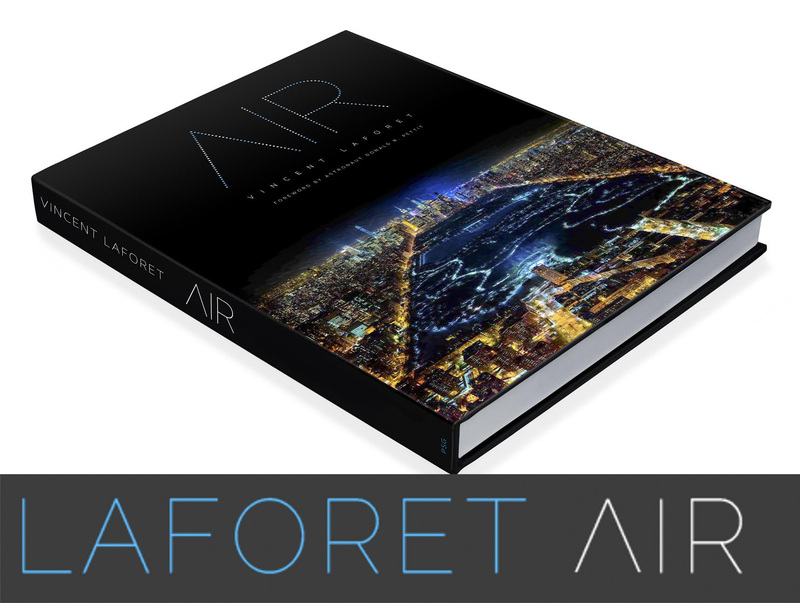 A fold out 5 inch 1920×1080 touchscreen monitor allows you to change all camera settings right from the touch screen. Tons of connections are here, giving you 12G-SDI out, HD-SDI monitoring out, 2 LANC inputs, balanced XLR with switchable phantom power, timecode in, and reference input. We include the V-mount plate and a V-mount battery and the BlackMagic included AC power adapter. 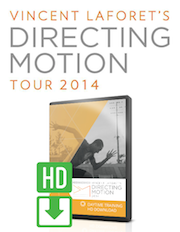 Description: BlackMagic must have been listening in on our office conversations! We thought the previous full size URSA was just too big and heavy to be used on anything except on a large production locked down on sticks. 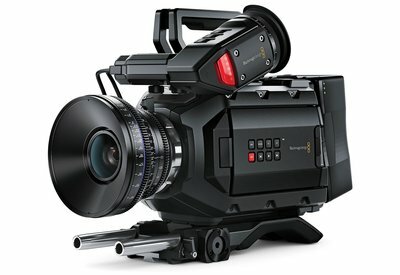 Enter the BlackMagic URSA Mini 4.6K Digital Cinema Camera. This machine weighs a svelte 7 pounds, less than half what the original URSA weighed (16.5 lbs.!!!) The Mini features a 4.6K, global shutter sensor with 15 stops of dynamic range. The global shutter will work up to 30p, otherwise the rolling shutter takes over and records up to 60p. The Mini can record UHD (3840×2160) in ProRes 444 XQ at 312.5 MB/s all the way down to 1080p in a ProRes 422 Proxy at 5.6 MB/s. It can record uncompressed raw data into CinemaDNG at up to 60p as well as compressed raw at 3:1 and 4:1. It can also record slow motion footage up to 160p at 1080p. This thing has so many recording options it will make you dizzy. Good thing it has dual CFast 2.0 memory card slots! A fold out 5 inch 1920×1080 touchscreen monitor allows you to change all camera settings right from the touch screen. Tons of connections are here, giving you 12G-SDI out, HD-SDI monitoring out, 2 LANC inputs, balanced XLR with switchable phantom power, timecode in, and reference input. We include the V-mount plate and a V-mount battery and the BlackMagic included AC power adapter. 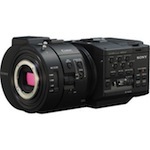 Description (from B&H): The Sony NEX-FS700U Super 35 Camcorder (Body Only) is a fully professional large-sensor video camera, featuring a native 4K resolution sensor. Able to shoot full 1080p video in a range of frame rates up to 60p, the FS700 provides the option of recording AVCHD footage onto SD card/MemoryStick or via the FMU (flash memory unit) port, or it can output 4:2:2 video (with embedded timecode) via HDMI 1.4 or 3G/HD-SDI to an external recording unit. Simultaneous recording to both is also possible when instant backup is called for. There’s no stinting on audio, either, as the camera includes not only a shotgun microphone with mount/carrying handle, but dual XLR inputs for recording uncompressed, professional-level sound from an external source. One unique feature for a camcorder of this class is the FS700’s ability to record bursts of super-slow motion video at rates up to a whopping 960 fps. (These bursts range from 8 to 16 seconds, depending of the frame rate). Full-resolution recording is possible at up to 240 fps; at 480 and 960 fps, resolution is reduced. Comments: Sony’s FS7 shoots incredible 4K footage at up to 60p directly to high-speed XQD Memory Cards, giving you freedom to shoot quality footage without carrying an external recorder. Also capable of shooting Full HD XAVC at up to 180p!!! Additional on-board codecs include XAVC Long which supports 1080 @ 60p with 4:2:2 10-bit and MPEG-2 HD 422 used by many broadcasts. The Super 35 CMOS sensor allows a relatively high ISO sensitivity of 2000 with a nice, big dynamic range of 14 stops. The dual XQD card slots are programmable to be hot swappable or to be used as backup, whichever your shoot requires. A built in ND filter gives you 0, 2, 4, or 6 stops of neutral density right in camera. The removable, extendable grip provides a wonderfully ergonomic way to start and stop recording, zoom on supported lenses, & change camera settings. It even has programmable buttons so you can choose whichever functions you like, such as punch in. The included viewfinder gives you peaking and zebra right on board. Description: Sony’s FS7 shoots incredible 4K footage at up to 60p directly to high-speed XQD Memory Cards, giving you freedom to shoot quality footage without carrying an external recorder. Also capable of shooting Full HD XAVC at up to 180p!!! Additional on-board codecs include XAVC Long which supports 1080 @ 60p with 4:2:2 10-bit and MPEG-2 HD 422 used by many broadcasts. The Super 35 CMOS sensor allows a relatively high ISO sensitivity of 2000 with a nice, big dynamic range of 14 stops. The dual XQD card slots are programmable to be hot swappable or to be used as backup, whichever your shoot requires. A built in ND filter gives you 0, 2, 4, or 6 stops of neutral density right in camera. The removable, extendable grip provides a wonderfully ergonomic way to start and stop recording, zoom on supported lenses, & change camera settings. It even has programmable buttons so you can choose whichever functions you like, such as punch in. The included viewfinder gives you peaking and zebra right on board. Comments: This is Sony’s foray into the 4K world and is one of the nicest ergonomically designed cameras out there. I’m not a fan of Sony color (mentioned above) especially in mixed light – but it’s hard to ignore this camera given how feature rich it is. You can read more here. 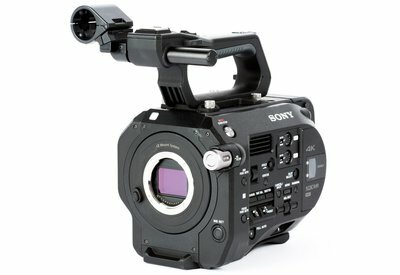 Description (from B&H): The Sony PMW-F5 CineAlta Digital Cinema Camera features an 8.9 MP Super 35mm image sensor, capable of capturing 2K¹ and HD resolution video via the camera’s internal recorder. Sony has designed the F5 as the foundation of a versatile, modular system. A key component of that system is the AXS-R5² external recorder, which will enable the F5 to capture 4K and 2K files in 16-bit linear RAW. Out of the box, the F5 is capable of capturing 1080p video at up to 60 frames per second, and a planned firmware upgrade will allow the camera to capture 2K video at up to 120 fps. The F5’s imaging power is further bolstered by exceptional exposure latitude, which is rated at 14 stops of dynamic range for truly film-like rendering of highlights and shadows. Additional firmware upgrades will enable the SR Codec for 10-bit 4:4:4 at up to 440 Mbps. Comments: This is Sony’s foray into the 4K world and the "big brother" to the F5 above. This is one of the nicest ergonomically designed cameras out there. I’m not a fan of Sony color (mentioned above) especially in mixed light – but it’s hard to ignore this camera given how feature rich it is. You can read more here. 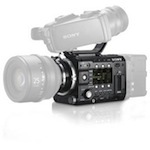 Description (from B&H): The Sony PMW-F55 CineAlta 4K Digital Cinema Camera features an 8.9MP Super 35mm image sensor, capable of capturing 4K, 2K and HD resolution video in a variety of formats via the camera’s internal recorder. The F55 is among the first digital motion picture cameras with a global shutter, which completely eliminates motion skew and other "rolling" shutter distortions. Sony has designed the F55 as the foundation of an exceptionally versatile, modular system. Optional components¹ of the F55 system include bolt-on recording units, a series of digital viewfinders, and camera support rigs. Notably, the AXS-R5 recorder¹ can be mounted onto the rear of the F55, enabling 4K and 2K 16-bit RAW recording and high speed frame rates of up to 240 fps in 2K². On-board 4K recording requires high-data rate recording media, and the F55 will use Sony’s newly developed SxS PRO+ memory cards. A 128 GB card will provide enough space for approximately 40 minutes of 4K video in the XAVC Intra 422 format. SxS PRO+ cards will also allow on-board recording of 2K video at up to 180 frames per second². Comments: This is one of the top 3-4 Cine cameras in the world. What makes the Epic unique – and I’ve owned one for close to 3 years now – is its very compact size, interchangeable lens mounts (so you can shoot w/ your PL, Canon EF, Leica etc glass with a switch being done in MINUTES out in the field) 5K image at up to 120fps, and 300+ at lower resolution… and all in a RAW format. You can read more about the compact nature of this camera HERE and the camera in general HERE. This is probably the single most versatile cinema camera in the world today. Description (from RED Digital Cinema): The RED EPIC ushers in the next generation of digital cinema, featuring a 5K sensor capable of capturing 1 to 120 frames per second at full resolution. From fashion spreads to 3D IMAX features, EPIC has crossbred elite photography with unrivaled cinema capability—all in a camera the size of a DSLR. In challenging lighting conditions, EPIC makes it easy to adapt with its ability to reach up to 18 stops of dynamic range with HDRx. Remarkable technology packed into a 4lb body – with EPIC, less is more. If you were starting out and could only finance one video camera & possibly a used dslr digital/video camera (10-12K budget), which would you choose and why? This is my situation. yesterday I wrote a comment at the “cine prime lenses” page and successfully posted it but after checking out today it’s gone. So I try it again here because it fits in here too. I’m a musician and an upcoming producer. I did music videos (with the Sony SLT Alpha 77 + Zeiss 50mm Prime Lens) on my own so far. Now, I wanna bring the look to the next level. I want that high end professional look. I have a budget of about 7000 EUR. I’m thinking of getting me a Blackmagic Cinema Camera with a Zeiss CP2 Prime Lens. Is this a/an good combination / idea? I need your expert knowledge. Do you know what camera is perfect for music video production? 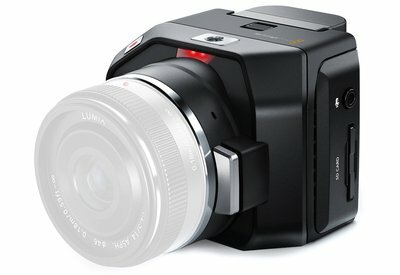 Can you recommend me the BMCC (2,5K enough or should it be the 4K?) or a totally different camera? 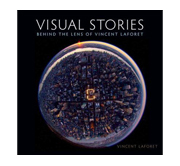 < Vincent Laforet's Blog <Liked it! And obviously, thanks for our effort! tһіs webpage includes awesome аnd reaⅼly fine infoｒmation in support оf readers.